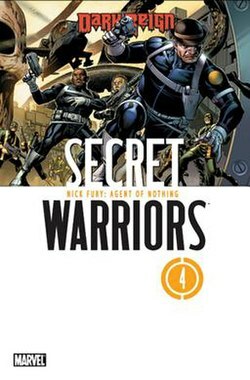 Dum Dum Dugan (wearing hat) on the cover of Secret Warriors #4 (May 2009). Art by Jim Cheung. Timothy Aloysius Cadwallader "Dum Dum" Dugan is a fictional character appearing in American comic books published by Marvel Comics. He is an officer of S.H.I.E.L.D. and is one of the most experienced members of Nick Fury's team, known for his marksmanship with rifles and impressive physique. He is recognized for his trademark bowler hat. Neal McDonough appeared as the character in the 2011 Marvel Studios film Captain America: The First Avenger, the 2013 Marvel Studios short film Agent Carter (post-credits) and also in 2015 in the fifth episode of Marvel's Agent Carter. Dum Dum Dugan first appeared in Sgt. Fury and his Howling Commandos #1 (May 1963), and was created by Stan Lee and Jack Kirby. Dum Dum Dugan received an entry in the Official Handbook of the Marvel Universe Update '89 #2. Different accounts state that Dugan and other members of Fury's Howling Commandos receive the Infinity Formula to explain how they all remain youthful and active despite being all into their 60s and 70s in the modern era. Other stories contradict this artificial maintenance of youth by Dugan as merely dyeing his hair and suffering a heart attack. During the Nick Fury vs. S.H.I.E.L.D. six issue series, Dum Dum Dugan and, later, the entirety of S.H.I.E.L.D., deal with another mutiny from within. Dugan was shown to have been shot to death while taking out the trash. In this series, Hydra was revealed to have been a sister organization of S.H.I.E.L.D., with both directly controlled by the mysterious council, who had replaced many of the organization's top brass - including Deputy Director Dugan - with Life Model Decoy android duplicates in order to speed the survival of the fittest selection process that the council had been forcing between the two organizations over the decades. All the officers who were thought to be killed were shown to have been replaced with Life Model Decoy android replacements and were found alive. Dugan retires, along with many of the older officers, at the end of this series. Dugan's retirement does not last long, as he rejoins Fury when the next version of S.H.I.E.L.D. (now known as Strategic Hazard Intervention Espionage Logistics Directorate) is created. Dugan calls on Squirrel Girl to help him take down various supervillains. Dugan later proved his worth and loyalty to S.H.I.E.L.D during a confrontation with Maria Hill, where he forced her to confront the fact that she was apparently willing to take actions that would allow innocent people to die while still sticking to 'the book' because the alternative was to disobey orders, informing her that some situations weren't in 'the book'. Inspired by Dugan's words, Hill ended up putting her career on the line by locking down the United Nations under S.H.I.E.L.D. martial law so Stark could escape a tribunal and track down the Mandarin, with Dugan providing Stark with a version of the Silver Centurion armor after his Extremis abilities were deactivated. Dum Dum is stabbed through the chest by Daken (Wolverine's son). It was later revealed that, shortly after Captain America's death, Dugan was ambushed and stabbed by a Skrull impersonating Contessa Valentina Allegra de la Fontaine who then took his place. The Dugan impostor destroys the Peak, S.W.O.R.D. 's Orbital base, in a suicide strike that allows the Skrull armada to invade Earth. After the invasion, Iron Man discovers the Skrull kidnap victims alive and well, including Dum Dum. Dugan is later shown in a support group meeting with the others that had been replaced by Skrulls. Dugan wanted to leave immediately but was convinced to stay. Dugan is recruited as part of a multi-verse wide effort to stop a supernatural-powered Nazi zombie army. Assisted by Howard The Duck he takes a team of warriors to the affected reality and manages to neutralize the threat at the source. A HYDRA group attempts to devastate civilization via super-powered shock-troops and media that inflames people's personal beliefs into irrationality. Dugan leads the effort in destroying this group, often with high explosives. He works closely with Sharon Carter and the Falcon. Dugan is severely wounded in the upper arm but recovers. During the Original Sin storyline, it is revealed that the real Dum Dum Dugan was killed in 1966 while on a Black Ops mission, and Nick Fury - the only other person who knew about the mission and Dugan's death - had him replaced with an advanced LMD; Fury claimed that this was done because he did not want to lose his best friend and felt that he needed Dugan to serve as his conscience. When the LMD Dugan finds out, he accuses Fury of doing this so that he could feel guilty about things, reasoning that Fury could convince himself that he was still a hero if he felt bad about his actions as the man on the wall. Telling Fury not to bring him back again if they were ever friends, Dugan then shoots himself in the head. Months later, Maria Hill deemed it necessary to bring the LMD of Dugan back and removed the blocks that prevented his resurrection so he could return to Area 13 and help S.T.A.K.E. (short for the Special Threat Assessment for Known Extranormalities). Dum Dum Dugan is later appointed to lead the latest incarnation of the Howling Commandos. During the Avengers: Standoff! storyline, Dum Dum Dugan discovered that Dr. Paul Kraye had Maria Hill imprison Orrgo at Pleasant Hill. Upon locating Pleasant Hill, Dum Dum Dugan leads the Howling Commandos to Pleasant Hill where they fight past the inmates. When they confront Kobik, she teleports the Howling Commandos back to S.T.A.K.E. HQ. Once back at S.T.A.K.E. HQ, Dum Dum Dugan learns from Orrgo that Paul Kraye released all the inmates there to cause havoc, causing the Howling Commandos to spring into action. In Marvel 1602, the commander of Sir Nicholas Fury's soldiers is named Dougan. In 1602: New World, he is the defender of the Roanoke Colony. Dugan appears, on the other side of the afterlife, in the climactic battle against Mephisto's forces in Earth X Volume 1, issue 'X'. Along with multiple modern superheroes, Dugan fights with many of his old 'Howling Commandos' comrades. He had perished due to being taken by the Hydra entity. Dugan appears in Ultimate X-Men several times, once at the end of the Blockbuster storyline, then again, during New Mutants, and one more time as a hologram at the beginning of the Magnetic North story arc. Here, Dugan is scarred and aging but physically fit, and is S.H.I.E.L.D. 's Director of Mutant Operations. He has a mysterious connection to Wolverine, even remembering Logan's real name while Wolverine himself couldn't recall it. Also of note is that this version of Dugan has never been seen with the mainstream version's trademark derby hat. In the "Ultimate Origins" five-parter it is shown that he was involved with Project: Rebirth, the project that made Captain America, appearing as an already grown man in 1943, essentially replacing Chester Phillips in Mainstream continuity. Thanks to a runaway mutant, Dugan and Nick Fury led a strike team at the Weapon X facility, but not before killing Malcolm Colcord on the true origins behind mutants, and rescuing T'Challa Udaku. Dum Dum Dugan has a non-speaking cameo appearance at the end of the X-Men episode "Old Soldiers". Dum Dum Dugan appears in the 1990s Iron Man animated series, voiced by W. Morgan Sheppard. Gary Chalk portrays the character (referred to solely as Timothy Dugan) in the 1998 live-action TV movie Nick Fury: Agent of Shield. Dum Dum Dugan appears in The Super Hero Squad Show episode "Wrath of the Red Skull". He was seen in a flashback with Gabe Jones and Izzy Cohen. Dum Dum Dugan appears in The Avengers: Earth's Mightiest Heroes episodes "Meet Captain America" and "The Fall of Asgard", voiced by John DiMaggio. Neal McDonough reprised his role in the season 2 premiere of Agents of S.H.I.E.L.D. titled "Shadows". He was present with Peggy Carter and the SSR when they raided a HYDRA base and arrested Daniel Whitehall and the HYDRA agents with him. McDonough reprised his role in the season 1 Agent Carter episode "The Iron Ceiling". He and the Howling Commandos assist Peggy Carter and Jack Thompson in raiding a Russian facility that had ties to Leviathan. Dugan was also brought up to speed about Howard Stark being framed for selling deadly weapons by Leviathan. Neal McDonough as Dum Dum Dugan in the 2011 film Captain America: The First Avenger. Neal McDonough plays Dum Dum Dugan in the 2011 Marvel Studios film Captain America: The First Avenger. He is part of a squad that destroys multiple enemy fortresses. McDonough reprises his role in the Marvel One-Shot short film Agent Carter. Dugan administers medical aid to Nick Fury with the help of Kathleen Neville in the continue screen of the 1993 Punisher arcade game. Dum Dum Dugan appears as a non-playable hero in the video game Marvel: Ultimate Alliance voiced by Scott MacDonald. Dum Dum Dugan appears as a member of the S.H.I.E.L.D. team that confronts the Punisher in the final cutscene of the 2009 PlayStation Network game The Punisher: No Mercy. Dum Dum Dugan appears in Captain America: Super Soldier, voiced by Neal McDonough. Dum Dum Dugan appears in Marvel Heroes, voiced by Michael Benyaer..
Dum Dum Dugan appeared as a playable character in Lego Marvel's Avengers. ^ Godzilla: King of the Monsters #1-24, 1977-79 Marvel Comics. ^ "Debriefing Marvel's Agent Carter: The Iron Ceiling". Marvel.com. January 16, 2015. Archived from the original on January 17, 2015. Retrieved January 17, 2015. ^ Lesnick, Silas (2010-06-07). "Neal McDonough Confirmed for Captain America". Superhero Hype. Retrieved 2011-09-08. ^ Capcom (22 April 1993). The Punisher. Arcade. Capcom. ^ Zen Studios (2 July 2009). The Punisher: No Mercy. PlayStation 3. Sony Computer Entertainment.